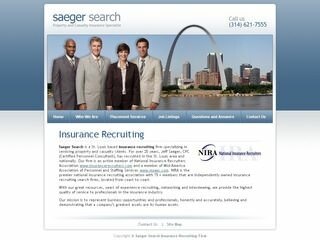 Saeger Search is a St. Louis based insurance recruiting firm specializing in servicing property and casualty clients. Their old website was outdated and boring. After some discussion and consulting, they decided that the best route for them was a completely new website with a fresh, modern look. Since Saeger Search fills many job openings in St. Louis and the greater Midwest area, we integrated a St. Louis riverfront photo with the famous Arch as the focal point. We also gave them more search engine friendly pages and optimized them to increase their exposure online.